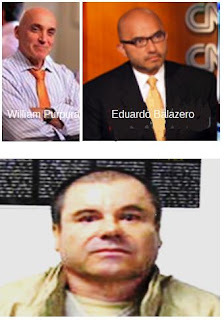 El Chapo’s lead attorney, Eduardo Balarezo, announced today that attorney William Purpura, has joined the El Chapo defense team. In August, Purpura was one of the four high profile defense attorneys who announced they had signed on to the case. However only Balarezo followed through. Purpura defended Richard Anthony "Richie Rich" Wilford in his drug trafficking case. No guarantee of payment no problem Mr. Guzman. Were just gonna write a little book on the trial and get paid...that's the catch!!! Pues no que muy bravo y hombrecito? Vale pura madre chapo. No pues esas mamadas es de todos los perros de este mundo, cuando andan bien se creen los grandes machos, luego cuando llega una perra y los pone en su lugar no hayan ni en donde meter la cola. OK. he has such a good team of lawyers, but he really has any chance to get less than life? the US already sentenced him before even the process started. i mean, look in what conditions they keep him. i'm not saying that he's innocent but they'll make an example out of him no matter how good his lawyers are. He has no hope of getting out. He's trying to make a deal, to protect his family. And maybe an easier time in prison. He has allot of big wigs on both sides of border scared. He has allot of dirt to tell. He paid off many, to keep his business rolling. All the trafficking charges are iron clad. They can't get him on murder in US. But as long as they do t screw up on legal procedures, an acquittal is nearly impossible. If you are a good worker and a good producer, you get good friends in high places, name your favorite mexican president, and his US president/sponsor and you see who got to grow his business as a mexican capo del narco. The US is just trying to squeeze La Chapa for some money, but mainly allowing "other allies" to get to the top of the business, like epn and the Jaliskas and MAO osorio chón under the w atchful eye of graduate of the School of the Americas in "soy bean production" secretario de la despensa nazional "giniral" salvador cienpedos still covering up for his army's role in the disappearances of the 43 Ayotzinapos among hundreds of thousands others, in their war on drugs used as an excuse to stick it to the mexicans, "because they can". MONEY, MONEY, MONEY gimme money...can't just print more and more MONEY, and who wants to steal "just a little?" And don't tell me "what? No spiky, no entender ni no sé." 8:11 please leave room for La Chapa's associates he helped trafficking drugs to the US to save the world from communism, and to make a few americans billionaires from all the drug trafficking since the end of WWII. El Chapo a product of the american politician and the fake war on drugs. His clients like Balarezo’s all were convicted and enjoy maximum terms. Personally, Chapo might be better off with a federal public defender once again. He is another ambulance chaser hoping for a book deal payday. Nice racist statement you forked idiot. Stay behind the wall after it is built. 12:10 chances are the architects of "the wall" will be out of office before the first stone for the wall is set. And the way things are going, those architects may even end up in prison wailing for their own ambulance chasers. --At least nobody is accusing La Chapa of being a russian bought and paid for puppet. Chapo is an selfish idiot. Instead of spending all this money in a futile attempt to defend himself in who knows how many different Federal District courts. Just plead out and let your family enjoy your money. Easier said than done. Guzman is selfish and an idiot, however his pride is more important than money and yet his pride is dependent on money. Just think of how he handled the first time in prison: parties, drugs and alcohol, women, conducting business, etc. And he still chose to escape? He could have easily completed his prison term, having a few more on the payroll, and possibly be free with more connections up to this day. So, if anything maybe others can learn from his mistakes. For now, his leniency may point more towards his financial decisions. His financial decisions for the people such as charities, opening food banks, thrift stores, etc. without ponding off the responsibility on the people. It is not like he cannot afford it alongside supporting his family. when he goes to the crapper in his prison cell. Here, many significant issues are already included in the original Motion to Dismiss. You see, Mr. Guzman's current lawyers may claim that the Mexican government did not agree to criminal forfeiture, and hence Mr. Guzman's legal team may assume that they will ultimately be paid. Specifically, Mr. Guzman may have standing to raise Violation of the Extradition Treaty between Mexico and the United States. Some observers are claiming that Mexico's Consent Agreement to assumed violations of the Rule of Specialty may be based on materially false and misleading assertions and omissions. More to the point, Guzman's indictments were originally filed in the Southern District of California and the Western District of Texas. And yet the US Attorney's Office plans to prosecute Mr. Guzman in the Eastern District of New York. Again, these two facts, in and of themselves, may represent material violations of the Rule of Specialty as outlined in the Extradition Treaty between the United States and Mexico. Also, the timing of Mexico's Consent Agreement to assumed violations of the Rule of Specialty relating to Mr. Guzman's extradition appears to be creating some skepticism. Diplomatic Note #17-0245 is a document of nearly 100 pages. Supposedly, senior Mexican officials decided to grant consent to assumed violations of the Rule of Specialty within hours of receiving it. Word on the street is the Consent Agreement had not even been agreed upon by Mexican and American officials until the jet carrying Mr. Guzman had already left Mexican airspace. Finally, some scholars of International Law may conclude the following. Mexico's rapid response to the Diplomatic Note, as generated by the United States, is at best questionable and may even imply that diplomatic coercion may have been employed. Secondly, the original Request for Extradition, as presented by the United States to Mexico, may contain material omissions regarding the destination and trial location of the aforementioned matter. And lastly, Mexico has never formally agreed to criminal forfeiture and the possible confiscation of Mr. Guzman's assumed ill-gotten gains. Hence, with sufficient legal capital, the legal team of Balarezo and Purpura could appeal these matters all the way to the United States Supreme Court. Off the record; Mr. Guzman's defense counsel could appear foolhardy in requesting a jury trial. Most juries are simply incapable of interpreting, analyzing and evaluating the intricacies that these current indictments entail. Trial before a Judge without a jury would clearly be preferable here, especially with the notion that testimony related to International Extradition Law may be allowed at trial and presented in a forthright attempt to bolster the possibility of an appeal. Most cognizant observers believe the US Attorney's Office would consent to an initial trial without a jury because the possibility of jury tampering is virtually eliminated. And remember, any possible convictions relating to the the currently filed indictments will be subject to vigorous appeal. However to answer you question specifically, the likelihood of Mr. Guzman returning to the country of his birth is dismal at best. Clearly, the US Attorney's Office is vehemently intent on securing at least one conviction; again subject to appeal. Word on the street is that fully 80% of the prosecution's efforts is to be built upon the sworn testimony of the Flores twins. And last but not least el chapo could receive a dismissal for a prejudice jury after a tv series had led him to not receive a fair trial. What happens if he opens a GoFundMe account???? @5:33 johnnies Cochran? This is shorty we are talking about. Where you gonna find a glove too small? 12:43 pos on his little Pinga güey, or on yours.